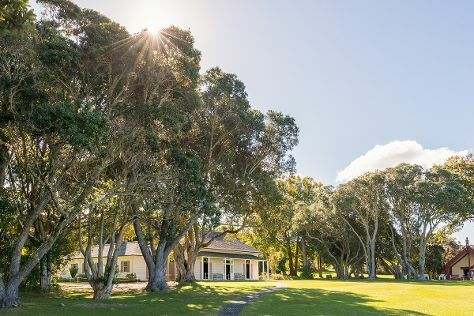 Set among the picturesque peaks and glacially carved fiords of Fiordland National Park, Te Anau offers those wishing to explore the park a great place to stay and enjoy the relaxing atmosphere of a small town in an enviable location. 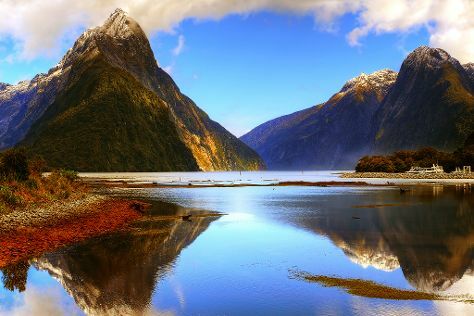 On the 24th (Mon), hike along The Chasm Walk and then explore the activities along Milford Sound. Keep things going the next day: explore the activities along Ivan Wilson Park, look for gifts at Kowhai Gifts & Souvenirs, and then contemplate the waterfront views at Doubtful Sound. Plan my day in Te Anau using traveler tips and tourist information provided by Inspirock. Singapore, Singapore to Te Anau is an approximately 18.5-hour combination of flight, bus, and taxi. The time zone difference when traveling from Singapore to Te Anau is 4 hours. Finish your sightseeing early on the 25th (Tue) so you can take a bus to Queenstown. Sheltered in an inlet of Lake Wakatipu, the resort town of Queenstown enjoys a strong reputation for its adventuring and skiing opportunities. Peregrine Wines and Artbay Gallery are good opportunities to explore the local culture. For shopping fun, head to Silver Fern Gallery or The Barn. Next up on the itinerary: get some thrills on the water with a speed boat tour, get the adrenaline pumping with an extreme tour, take a tour by water with Boat Tours & Water Sports, and identify plant and animal life at Kiwi Birdlife Park. Plan my trip to Queenstown with suggested itineraries provided by Inspirock. You can take a bus from Te Anau to Queenstown in 3.5 hours. Wrap up your sightseeing on the 28th (Fri) early enough to drive to Fox Glacier. A trip to Fox Glacier brings you close to one of New Zealand's most easily accessible natural wonders. On the 29th (Sat), trek along Fox Glacier Te Moeka o Tuawe Valley Walk, then identify plant and animal life at Fox Glacier, and then enjoy the sand and surf at Gillespies Beach. Get ready for a full day of sightseeing on the 30th (Sun): trek along Fox Glacier Hiking Trails, explore the activities along Lake Matheson Walk, then take an unforgettable tour with a helicopter tour, and finally explore the striking landscape at Franz Josef Glacier. To see where to stay, photos, other places to visit, and other tourist information, refer to the Fox Glacier online visit planner . Traveling by car from Queenstown to Fox Glacier takes 4.5 hours. Alternatively, you can take a bus. Wrap up your sightseeing on the 30th (Sun) early enough to travel to Wellington. Wellington, the world's southernmost capital city and New Zealand's second most populous urban area, combines the nation's rugged history and nature with its modern and cosmopolitan present. 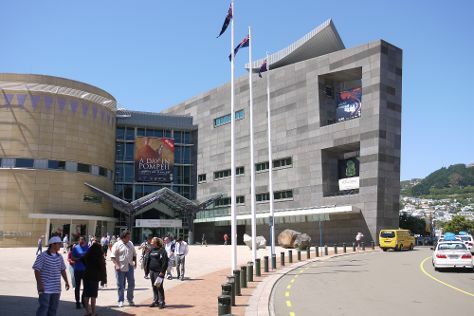 Start off your visit on the 31st (Mon): take a memorable ride with Wellington Cable Car, take a stroll through Cuba Street District, then see the interesting displays at The Weta Cave, and finally see the interesting displays at Museum of New Zealand (Te Papa Tongarewa). To see maps, reviews, ratings, and more tourist information, read Wellington road trip planning website . Traveling by combination of bus and flight from Fox Glacier to Wellington takes 8 hours. Alternatively, you can do a combination of car and flight; or do a combination of bus and ferry. In December, daytime highs in Wellington are 22°C, while nighttime lows are 15°C. Finish your sightseeing early on the 31st (Mon) to allow enough time to travel to Taupo. The resort town of Taupo lies on the banks of Lake Taupo, the largest body of water in the whole of Australasia. Kick off your visit on the 1st (Tue): take in the dramatic scenery at Huka Falls tracks, then get a taste of the local shopping with Wairakei Golf and Sanctuary, then explore the galleries of L'Arte, and finally see the world from above with a helicopter tour. For reviews, photos, maps, and other tourist information, you can read our Taupo trip builder tool . Fly from Wellington to Taupo in 3 hours. Alternatively, you can drive; or do a combination of flight and bus. Finish your sightseeing early on the 1st (Tue) so you can travel to Paihia. The main tourist town in the Bay of Islands area, Paihia gives visitors a good range of accommodations, a convenient town center, long sandy beaches, and interesting architecture. Start off your visit on the 2nd (Wed): take in nature's colorful creations at Waitangi Treaty Grounds, then admire the sheer force of Haruru Falls, and then look for all kinds of wild species at Paihia Harbour. Keep things going the next day: take a memorable tour with Tours, look for gifts at The Cabbage Tree Shop, then steep yourself in history at Pompallier Mission and Printery, and finally hike along Kororipo Pa Historic Walk. To find traveler tips, where to stay, and other tourist information, you can read our Paihia travel route planner. Traveling by combination of flight and taxi from Taupo to Paihia takes 3.5 hours. Alternatively, you can do a combination of bus, flight, and taxi; or drive. You'll have a few hours on the 4th (Fri) to wrap things up before traveling home.